The fiery images of Charlottesville and the blistering grief that followed have sounded a wake-up call, and one small college in South Carolina continues to answer. In the hope of healing the wounds of the past—and lowering the fever of racism that threatens to cripple our future, Newberry College will host the fifth annual Dufford Diversity and Inclusion Week Oct. 16 – 23, 2017. (See schedule of events below). All events are free and open to the public except where noted. 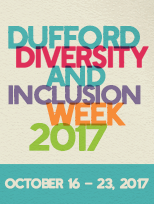 Dufford Diversity and Inclusion Week is part of Newberry College’s ongoing efforts to promote appreciation for diversity and create a culture of respect. The program promotes an appreciation for the differences that give individuals a sense of identity – among them religion, sexual orientation, disability, gender, age, ethnicity and race. Of particular interest in the wake of the Charlottesville tragedy, is the keynote presentation by Southern Poverty Law Center. Founded in 1971, SPLC’s innovative legal strategies crippled many hate groups and white supremacist organizations. The Southern Poverty Law Center continues to monitor hate groups. Its publication, “Teaching Tolerance,” is used in classrooms across the nation to promote respect and reduce bullying, particularly of children with differences. Dufford Diversity and Inclusion Week is sponsored by educator and social justice activist William Dufford, Ph.D., of Columbia, S.C. Born and raised in a segregated South within a block of Newberry College, it never seemed out of the ordinary to Dufford that he attended an all-white school, was captain of an all-white basketball team, was taught by all-white professors or that the only African-Americans on campus served food or swept the halls. Dufford’s eyes were slowly opened to the injustices that were a fact of life for most African-Americans when he served with African-American men in the Navy and as he came to know African-American students during his doctoral studies at the University of Florida. With awareness came a desire for change and Dufford began to grow beyond his roots to become a champion for social justice. The week-long series will close with a documentary video and book signing about Dufford’s evolution from a “good old boy” at all-white schools into a champion for social justice in education, working to ensure all South Carolinians have access to the transformational power of a good education. Newberry College basketball players will greet guests attending the video and book signing event. Dufford will be introduced by his former student and longtime friend, U.S. District Court Judge Richard Gergel. Gergel presided over the emotional court trial of Dylan Roof, who massacred seven parishioners at a historic African-American church in Charleston.